"I have come to sow the seed of love in your hearts so that, in spite of all superficial diversity which your life in illusion must experience and endure, the feeling of oneness, through love, is brought about amongst all the nations, creeds, sects and castes of the world. "In order to bring this about, I am preparing to break my Silence. When I break my Silence, it will not be to fill your ears with spiritual lectures. I shall only speak One Word, and this Word will penetrate the hearts of all men and make even the sinner feel that he is meant to be a saint, while the saint will know that God is in the sinner as much as He is in himself." Meher Baba has indicated that the speaking of the Word would in actuality be a release of immense spiritual energy and irresistible love, and that all persons and creatures will benefit from it. " because all forms and words are from this Primal Sound or Original Word and are continuously connected with It and have their life from It, when It is uttered by me It will reverberate in all people and creatures, and all will know that I have broken my Silence and have uttered that Sound or Word." .The Word that I will speak will go to the world as from God, not as from a philosopherit will go straight to its heart." Throughout the years Baba indicated that the breaking of his Silence would come in a way and at a time that no one could imagine, and that his "speaking the Word" after the appearance of utter defeat would be his only real miracle in this incarnation as God in human form. "When I break My Silence, the impact will jolt the world out of its spritual lethargy... What will happen when I break my Silence is what has never happened before ... The breaking of my Silence will reveal to man the universal Oneness of God, which will bring about the universal brotherhood of man." 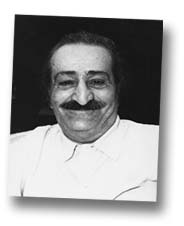 All quotes by Meher Baba © Avatar Meher Baba Perpetual Public Charitable Trust, used with permission.